One might wonder how artists arrive at these junctures of abstract fissures. I can only say that it is a ‘process’, and a delightfully experimental one at that. For this exercise from 1st year drawing class at ACSA we were given an object which was wrapped in material. So we had to draw what we felt it looked like. Then 3 new objects were placed on the table for us to superimpose over what we had drawn from memory. The teacher then cut our drawing in half and gave one half away to another student whilst we inherited someone elses completely new work to join to our drawing. We did not choose whose drawing we could match with. BUT we did have to incorporate their style into ours and vice versa, to make it look homogenous once more. 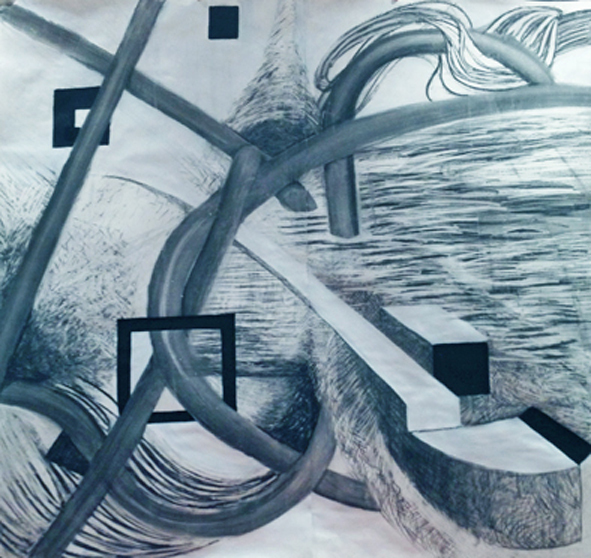 I have titled it “I am all at sea”: 1.5metres square, charcoal on 350gsm paper.